The Michigan Technological University Archives and Copper Country Historical Collections is midway through its heritage grant project, Black Voices in the Copper Country, which examines the social and cultural history of African-Americans in this remote part of Michigan’s northwestern Upper Peninsula. The Copper Country, still defined by the industrial copper mines that once boomed throughout the region, has a long history which is all too often explored through the lens of the mining. The industrial heritage of the area, as well as the mostly European immigrants that worked in the mines, are important to the history of the region and its sense of identity. But it is not the complete story. In an effort to promote an inclusive history, the Michigan Tech Archives has been working for the past several months on a long-term research project to identify and assess collections that relate to African-Americans in the area. Lindsay Hiltunen, Senior Archivist, and Martin Hobmeier, Project Researcher, have done extensive research into the holdings of the Archives to find manuscript collections, photographs, census data and other primary source materials that better help explore the narratives of underrepresented narratives in Upper Peninsula history. The overall objectives are to present a more robust local history that includes diverse lives and stories. The first portion of the project has focused heavily on uncovering resources, developing a research guide and background planning for a web exhibit that explores historic black experiences in the community and on the Michigan Tech campus. Michigan Tech African-American Student Group, 1981. As primary researcher, Martin’s first task was to check the Archives’ collection of Michigan Tech Year Books (Keweenawan) for evidence of African American and African international students. Covering the years 1916 to 1990 (the Keweenawan was again made available in print from 2000-2003, but these volumes are of little value in our context, as hardly any individuals are identified by name in the photographs) he came across some 300 distinct identities of black students at Michigan Tech. Many have multiple photographs and entries over multiple years, and most likely more information on some of these people can be found elsewhere in the collections, and accordingly, the next step will be to look through the biographical files. One interesting trend we notices was that while the number of clearly black students gradually increased over the years. Yet even in the 1980s, this group only made up a tiny proportion of the total student body. This might explain why many black students seem to have been completely integrated into the activities of the entire student body from the very beginning. African Americans and Africans were participants in honor societies, clubs, fraternities, varsity and intramural sports teams, and major social events alongside students from different racial and ethnic backgrounds from early on. The second task of the project was to check the names of local individuals identified as “black” or “mulatto” in historical Federal Censuses (1860-1900) against entries in the mining company employment records. 14 of these names can also be found in the employment card data bases, but based on the available biographical data, only four or five of these will likely correspond to African American individuals listed in the censuses. For the number of black individuals living up here at the turn of the century, it is interesting that only a few worked in the region’s most booming industry. This begs the question, where did these individuals work? How did they make a living in the community? Photograph evidence has been uncovered to suggest barber and construction laborer were popular positions during this era, but we’re sure there is more to uncover! Interestingly, the census data reveals that, though there seems to have been a surprising number of black individuals in the Copper Country throughout the early mining era, there must have been considerable turnover in the population. In 1900, only one of the individuals (if it even is the same person) listed in the 1860 census was still present in the area. Few of the surnames of African American individuals from earlier censuses appear among the African American population in the Keweenaw in 1900. We hope to gather more evidence as the project continues. 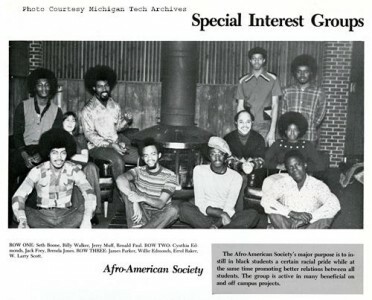 Michigan Tech Afro-American Society, 1973. While the research phase will continue for the duration of the project, we are moving steadily into the programming and exhibit phase as well. We’ve had one informal conversation circle about the project and another event is being planned for Black History Month at Michgan Tech’s Center for Diversity and Inclusion (CDI). Lindsay has been collaborating with Zack Rubinstein at the CDI to develop a photograph exhibit in the archives as well as plan a discussion with African-American student groups on campus to discuss how they can better preserve their organizational records, photographs and activities. Other forthcoming events include a lecture by Dr. Michelle S. Johnson, a Community Historian with the Michigan Historical Center, a presentation about the black experience on campus, and a photograph exhibit and discussion at the Carnegie Museum of the Keweenaw in Houghton. The project will culminate in a launch of the website and a formal reception at Michigan Tech’s Van Pelt and Opie Library. For more information about the project or to find out dates for upcoming events please contact Lindsay Hiltunen at copper@mtu.edu or (906) 487-2505. Lindsay Hiltunen is the Senior Archivist at the Michigan Tech Archives. She holds a MLIS in Archives Management and a MA in History, with a focus on labor history and the twentieth century United States. A native of the Copper Country, she was pleased to return to the Upper Peninsula and begin working full-time for the Michigan Tech Archives in 2014. Martin Hobmeier is a PhD candidate in Biological Sciences at Michigan Tech. As an undergraduate he double majored in Biology and History, importantly with some course work on ethnic history in the United States. He has been working as the primary project researcher since last fall.